I-87 N to exit 21. Turn left after toll booth and merge right onto 23 W toward Cairo. 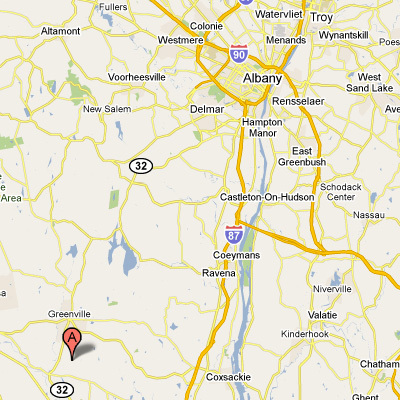 Go ~5 miles and turn right onto Route 32 toward Greenville. Pass through the town of Freehold, turn right onto Plattekill Rd across from JP's tack store. Go ~1 mile, turn left at stop sign, we are the first driveway on the right by the white farmhouses. Route 32 S. Go through the town of Greenville. Turn Left onto Plattekill Rd, across fro JP's tack store. Go ~1 mile, turn left at stop sign, we are the first driveway on the right by the white farmhouse. 90 E to 87 S to exit 21b Coxsackie. Turn left after the toll onto 9W. Go ~1.5 miles, t traffic light turn right onto Rt. 81. Go ~9 miles into town of Greenville, turn left at light onto Rt. 32 S. Go through town, turn Left onto Plattekill Rd, across fro JP's tack store. Go ~1 mile, turn left at stop sign, we are the first driveway on the right by the white farmhouse.